Jean Kazez: What Becomes a Monday Most? The Weight Of Things: Philosophy and the Good Life, by Jean Kazez (Blackwell Publishing $32.99). Reviewed by Peter Dornauf. From Aristotle's plea for rational moderation to Tolstoy seeking solace in religion and Nietzsche's scorn of the same, Jean Kazez (a PhD in philosophy) tracks an erudite pathway through and around the question of what it means to live the good life. The Weight of Things is no flabby self-help manual with pat paperback answers, but nor is it an impenetrable, high-minded, dry philosophical discourse. Here's a book that confronts the perennial questions in an engaging manner that does not disrespect our intelligence. Kazez manages, with apposite anecdotes and critical analysis, to speak to the general reading public without pomposity, yet several steps above those "how to" and "inspirational" reads. She can, for example, sum up a philosophical position in a few apt words. What, for instance, was the essential contribution of 20th-century existentialism in addressing the question of how to live? Kazez' astute reply is helping us to get by with a more honest acceptance of the human condition. The human condition gives us the problem of mortality, and Kazez then examines the quandary of transience via Tolstoy and Plato. The latter, she points out, would have made a lousy grief counsellor (his theories were too abstract) while Tolstoy, for her part, put too great a store on transcendence in providing meaning and comfort. She would prefer the deluxe model of the world, but knows that it's plain, yet "plainly marvellous". Her brief for the good life covers various qualities like happiness, autonomy, self expression and morality, but she's quick to point out the complexities associated with these elements. Ethics itself can be a tricky business. The Bible, for one, says nothing against slavery. Stoical detachment can be useful, but can only take us so far. Hedonism goes head to head with Epicureanism, but suffering can also be a valuable ingredient. This is readable philosophy and an intelligent book that provides a wealth of insight without avoiding the conundrums and ambiguities associated with the questions it raises. Peter Dornauf is a Hamilton artist, writer and teacher. The Waikato region, located on the western side of New Zealand’s North Island, is one of New Zealand’s most popular tourist destinations, with its unspoilt beaches, lush forests, hot springs and ancient underground glow-worm caves providing a unique and beautiful adventure experience. I read about those glow-worm caves in a wonderful discussion of the meaning of life by Richard Taylor. I thought it was a completely obscure reference. Shows what I know. How are we like the glow worms? You'll have to read Taylor if you want to find out (the essay is in the excellent anthology The Meaning of Life, edited by Klemke and Cahn). The picture at the top of this post. 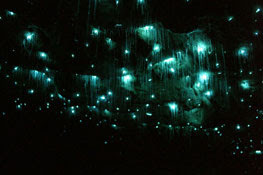 Glow worms on the walls of Waitomo Cave. New Zealand is full of cool places. We had a Big Trip planned before we repatriated, but it got canned by discovering i was ill again. There are lots of good things in Oz, too. I can't re-read TWoT on transcendence just now (see tp) because it has moved house ahead of me. I think this is the very first object of which we've said "I need the.....oh rats, it's in the other house". I feel honored that TWoT made the voyage. So when do you make the voyage? When the new bed gets delivered! (probably early-ish Jan, haven't got a date yet). I don't feel inclined for a folding camp-bed or a lilo, even though I now have my La-Z-Boy for the daytime. Oh good, Christmas at home, in the moors...(? )....sounds much better. also image 200. And image 260 is our glen, which has smaller hills becasue it is very close to the sea (the foreground in this pic looks misleadinlgy like a loch but is in fact just a flooded field). Christmas here would be 'better' only if I were fit enough to go for a walk (and also if the current clear cold weather persists, which is unlikely). WOW!! Those are gorgeous. I was thinking more flat moors (like the first picture). The rest remind me a bit of Alaska. Austere beauty. It looks cold. Then again, maybe in Aberdeen you'll be near a coffee shop and a bookstore, or maybe both in one. I'm a sucker for such things. We had a heavenly time seeing all the mountains in Alaska, but I have to admit one of the highpoints of the whole trip was visiting the Barnes and Noble in Fairbanks. I'm ashamed to admit it. Well, quite. If you actually live in the midst of the splendour, rather than just travelling thorugh with the scene changing all the time, you need to be able to get out and be active to appreciate it. I can't. Even 10 minute feeble wanders round the garden admiring plants and the view are not so enticing when it is either very wet or very cold. Our nearest coffe shop and bookstore are currently two hours away.